. Lots of people are doing a lot of things all day without having their stories told, and therefore do not get recognition that their lives are valuable and part of what makes our society what it is. Terkel understood that giving these people voices to tell their stories, and giving others their stories to read, increases our understanding of our fellow citizens, and thereby adds to harmony in our society. 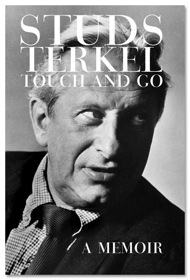 Thank you Mr. Terkel, you'll be missed.